We just dealt with some words for crops of debated identity - here's another one, but with a Purim connection. Early in this site, we discussed the Purim food hamentaschen, which literally mean "poppy pockets". The Hebrew word for poppy is pereg (sometimes parag) פרג. It is found in the plural - פרגין - in the Mishna (Sheviit 2:7, Chalah 1:4) and in the Talmud (Rosh Hashana 13b), listed together with other crops that aren't full grains like shumshum1 שומשום - sesame and orez אורז - rice. Most of the commentaries do identify pereg with poppy. For example, the Aruch defines it as the Latin papaver, and Rashi on Rosh Hashana uses the Italian word maco, whose cognates are found in a number of European languages. The Rambam on Sheviit translates pereg as khashkhash - the Arabic word for poppy. 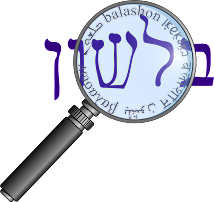 Many of the later European rabbinic works use the German (and Yiddish) word mohn. However, some more modern scholars disagree with this assumption, and say it is a type of millet. Ben Yehuda quotes Hrozny (found here in the original German) as saying that pereg derives from the Sanskrit word priyangu, meaning "foxtail millet" (or "panic seed".) Feliks has two more reasons to choose sorghum millet over poppy: pereg is mentioned in the mishna as a summer crop, and is used to make bread, both of which fit millet much more than poppy. And he also quotes Rabbi Natan Av Hayeshiva (one of the Eretz Yisrael Geonim, whose text was found in the Cairo Geniza) who identified pereg as dura דורה - sorghum, described here as a "summer crop of millet." 1. However some European Jewish scholars did identify shumshum as poppy. See Responsa Melamed Le-Ho'il 1:87, Encyclopedia Talmudit "chametz" footnote 709, and Jastrow on שומשמא. One of my favorite topics to write about is the change of meaning in words relating to food. We've already seen that a melafefon originally meant melon, now cucumber, and that botnim, while in modern Hebrew mean peanuts, meant pistachios in the Bible. However, these discussions, while interesting, don't have much practical impact. On the other hand, some debates have real halachic significance. Chitim are wheat and seorim are barley. We'll discuss kusmin in a future post, but now I'd like to deal with shibolet shual and shifon (or shipon, more on that in a bit.) In modern Hebrew, shibolet shual means "oats" (although "kvaker" is the common term), and shifon means "rye". This goes as far back as Rashi, who identifies them as such in his commentary (Pesachim 35a). However, many modern scholars disagree with this approach, such as Immanuel Low, who writes that shibolet shual is millet, and shifon is oats (both Jastrow and Ben Yehuda mention this approach), and more recently Yehuda Feliks, who says that shibolet shual is "two-rowed barley" (compared to the four and six rowed barley for seorim) and shifon is spelt (which in modern Hebrew is kusmin). Feliks gives a number of reasons for his conclusions - primary among them is that oats and rye were not commonly grown in the Land of Israel at the time of the mishna (this post does a good job of summarizing his arguments and those that disagree with him, on the identity of shibolet shu'al). Most of the proofs are based on biological or historical evidence - but I did find one etymological aspect: while many claim that the name "shibolet shual" comes the spike, shibolet, of plant looking like the tail of a fox, shual, (and we find the phrase "foxtail" with a similar meaning in English), Feliks believes that the name comes from the fact that foxes like eating the softer two-rowed barley more than other grains, in the same way that invei shual ענבי שועל - "blackcurrants" (literally "fox grapes") are so called because foxes enjoy eating them. While the etymology might not help us understand the identity of shifon, it should help with the pronunciation. Looking at vocalized editions of the Mishna and Talmud, I see that they are pretty much split down the middle: Steinsaltz and Artscroll have shipon (or shippon in the English translation), whereas Kehati and Jastrow have shifon. Ben Yehuda writes that the correct pronunciation is shifon, because the word comes from Greek - siphonion, which seems to be related to the word siphon, meaning "tube, pipe", perhaps related to the shape of the plant. (Klein, following Ben-Yehuda writes that, "The attempt of [Immanuel] Low to derive shifon from שוף [= to polish] is far-fetched.) I've found references to siphonion both as oats (avena) and rye (secale), so I don't think this helps us identify the original plant.